The SKY12245-492LF from Skyworks is a compact, high-power SPDT switch that operates from 0.3 to 3.8 GHz with a driver circuit for TD-LTE applications. It has an insertion loss of 0.2 dB and an isolation of 45 dB. The switch can handle up to 100 watts (38 dBm) of power. 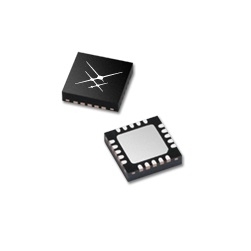 It requires 5 V of supply voltage and has a control voltage of 0/3 V. The switch can be tuned to specific RF bands within the range of 0.3 to 3.8 GHz by modifying external SMT components. The SKY12245-492LF is available in a small 20-pin Quad Flat No-Lead package that measures 5 x 5 mm. It can be used in TDD 2G/3G/4G LTE systems, High-power switch for micro-cell and macro-cell base stations and Active antenna array applications.